Goals achieved! Triumphs over adversity! Blurry photos taken with a phone! And more, all this week on the Rally Sputnik show! Following last weeks exciting episode (or not so much, but let’s keep the fantasy alive) we return to more exciting Talon action. Work and life got in the way all week but just like a mullet, when it’s all business up front there’s also a party in the back. So Saturday we went up – again with Brian the Firefighter – and got down to party business. (Note subtle ‘Russian’ reference there, too. Pretty good huh?). 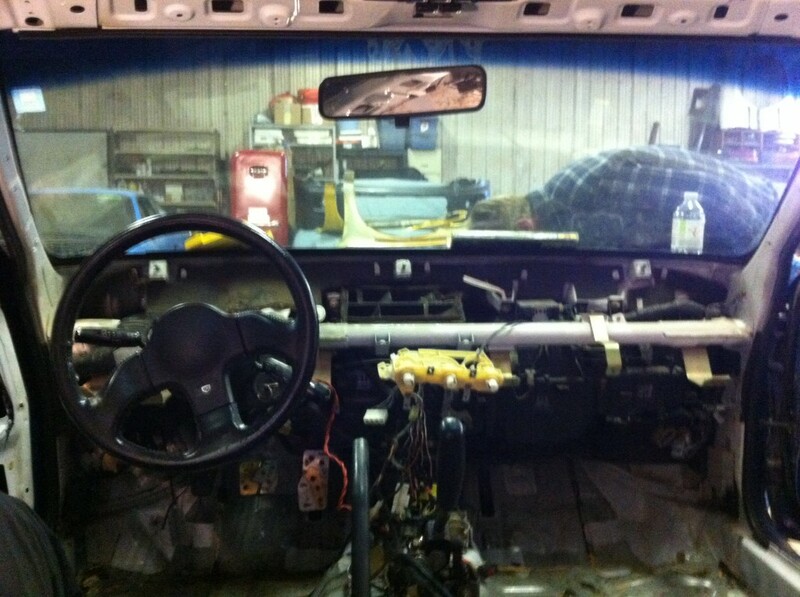 We pulled the dash, which was pretty painless. Even with the less electrically gifted team touching electrical stuff and using a how-to on the Internet nobody got hurt! That may be a first. We also pulled the front clip, which was pretty painful thanks to years of rust; it involved grinding the heads off of bolts, drilling out bolts, and occasionally even removing bolts properly. But that didn’t happen very often. (We did remove the other fender also, just didn’t take a picture of it apparently). The electrical came out pretty easily as did the dash, so that was a good sign. We also removed the body cladding, which revealed this nice bit of bodywork hidden beneath. 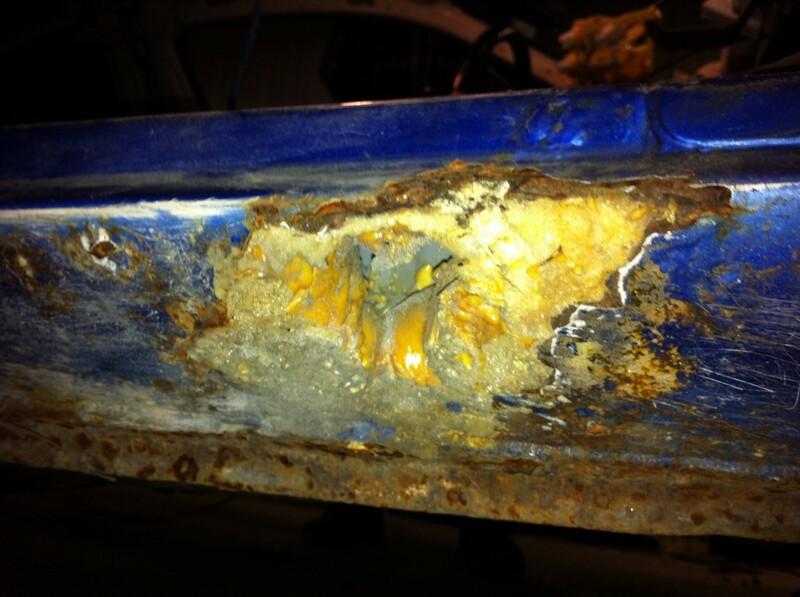 Since the car was white originally and this is blue, we assume that when they painted it they removed the cladding, saw a hole, filled it with spray foam, and then painted it. That they even bothered to remove the cladding when painting was a surprise. That they did a terrible job with yet another form of insulation (remember the fiberglass pink in the previous update?) is not. That will need some fixing. We also put the new ECU (with ECM link) in and tried to start it.By ‘tried’ you’ll gather we didn’t succeed. Well, you’re right. But then, the next day, with half the team out sick, Derek got it running on his lonesome! So yes, we can now say that the car does run, which is a significant step towards having a race car, or at least one that isn’t mostly imaginary. And also, check this out. Suspension! A suspension we understand! 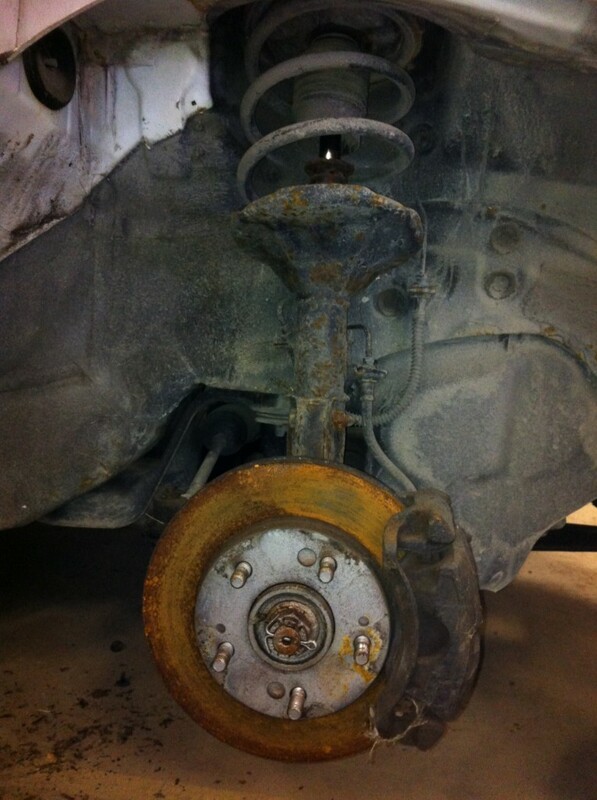 And with two-pot brakes! (1G’s had 1-pot so this means someone already did that swap for us). 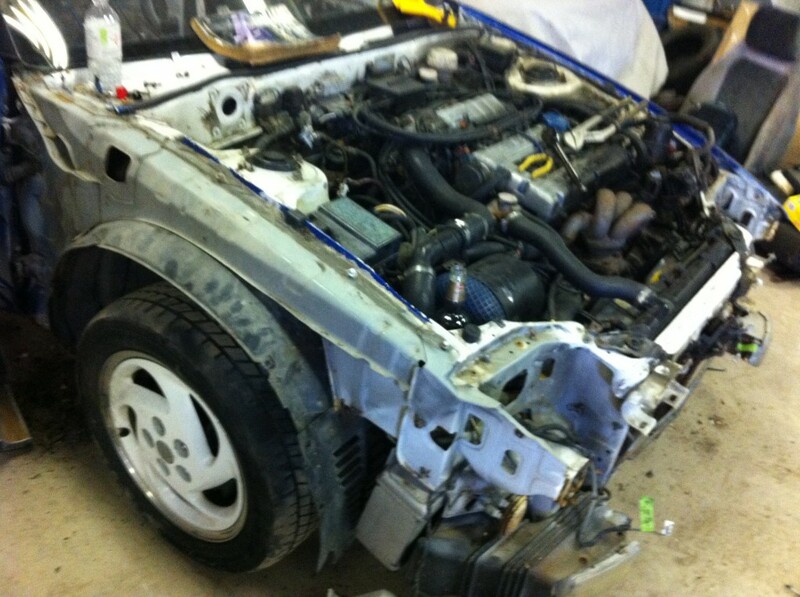 So now that we verified we have a running, stripped car we are now going to immediately render it non-running by pulling the motor out of it before transporting it down to Rally Race Ryan (I think we might shorten that to 3R) on the 19th. We will at least aim to make most of the mess at our shop before we take it to his very tidy one. Once Ryan has it he can start the cage and we will take the motor to get checked out; the guys we bought it from in Smiths Falls are motor builders and they also offered to do some bottom end work in exchange for some sponsorship but for now we’re just looking to confirm it won’t blow up on the first stage. Then we will go through all the parts that bolt on to a motor to see what we need to replace. – Replacement headlights as we’re planning to get a bit creative here. That’s always interesting… Hopefully from HSL also. We’re also ordering seats, belts, probably gauges, roll bar padding and some other stuff from Demon Tweaks in the UK; we’ll need to get an exhaust manifold from somewhere (as our Pacesetter won’t be legal for P4, so we’ll just hold on to that along with the boost controller); brake booster eliminator and bias controller, and probably a ton of other stuff. Build Diary – 3. Pull it, pull it….yessss….